is used to create images of the subsurface. 3-D representations using GPR are common. Geophysical surveys conducted by geophysicists, engineers, geologists, military, and underground utility locators are often used for mapping geology, scanning concrete and pavement, locating underground storage tanks UST, finding graves, archaeological investigations, mapping contamination, determining ice thickness, locating utilities, mining, mapping fracture and fault systems, detecting voids, forensic investigations, agriculture, finding drain tiles, forestry, military investigations, and security applications. Click here to rent GPR equipment from K. D. Jones Instruments. for acquiring data utilizing many different antenna frequencies. In general, engineers and geophysicists rent high frequency GPR systems (500 Mhz, 1000 Mhz, or more) for greater resolution. The higher resolution allows one to locate, in good record areas, smaller features such as wire mesh, rebar, voids, utilities, bullets, and nails or bolts. Please note that the first occurrence of metal limits greater depths of penetration. Be aware that greater resolution is often accompanied with a loss of penetration. To image conditions greater than approximately a foot or two with a high level of confidence, lower frequency GPR antennas are rented. 100 and 250 Mhz antennas can reach depths of 5 or more feet. 25 Mhz and 50 Mhz antennas may reach 10’s or 100’s of feet. GPR works well when acquired over electrically resistive materials, for example, sand, gravel, rock, concrete, wood, pavement, plastic, and ice. One way to determine if GPR may work at a site is to use an earth electrical resistivity meter to measure soil resistivity. GPR may fail when conducted over soils rich in clay minerals, water, or metal. However, these materials are often easily detected when located in electrically resistive materials (e.g. a metal conduit buried in a concrete slab). While the presence of water is an issue, GPR surveys conducted with low frequency antennas placed in the bottom of a nonmetallic boat can yield desirable results and some of the greatest depths of penetration are obtained over ice. Ice from fresh water is not typically a conductor of electricity; thus, the GPR signal passes easily through the ice. For help today, fill out GPRRental.Com’s form. Scroll down to skip over the form or go to the bottom of this page and leave a comment for someone to help you find an answer about ground penetrating radar. We will respond. GPRRental.com suggests renting equipment manufactured by Sensors & Software. Years of experience have made them a leader in ground penetrating radar technology. Their pulseEKKO PRO system can be easily configured with an unlimited range of bistatic antenna separations. Fixed antenna separations are utilized with the transducer based systems. Noggin units are self-contained GPR transducer systems. The fixed configurations are designed for common applications and packaged for simplicity and ease of use. While Sensors & Software offer a couple of more types of units designed for specific geophysical applications, their Conquest is very popular for investigating concrete. Unlike the pulseEKKO Pro system with TR1000 transducer, the Conquest utilizes a portable computer based system designed for imaging smaller areas, often 24 x 24 inches. Whereas, the pulseEKKO Pro TR1000 system can be configured for any size area. I am searching for a GPR system with which I may be able to locate erratic boulders (about 1-2 feet in length, or smaller, which may be buried at the bottom of rock basins or weathering pits under up to four feet of sand and gravel. Does such a unit exist? If so, what system would you recommend? Ground penetrating radar does well in dryer clay poor soils. The signal will more likely propagate to the target depth with these types of soils. However, size will make a difference. As the the erratic boulders become smaller and smaller, the target may become more difficult to interpret in the GPR record. If there is a high content of larger stones, which are not likely a concern, there may be a tendency for the GPR signal to disperse. In addition, the shape of the boulders will likely make a difference. The amount of surface area available, in part, controls how much of the signal is reflected back. Sensors & Software has some higher frequency systems, like the Noggin 250 MHz, Noggin 500 MHz, and Noggin 1000 MHz. However, too high of a frequency may yield too much detail and have limited penetration, which makes a record difficult to interpret. In contrast, a lower GPR frequency system may not may not provide enough detail. Thank you for your helpful information regarding my question about GRP units for detecting buried erratic boulders. I can see that the task is difficult but not impossible. May you please provide a price list for hire of GPR equipment in South Africa. Lately I have seen many requests for GPR from South Africa. I will make arrangements for someone to contact you from your region, on prices and availability of ground penetrating radar equipment. Are you interested in other geophysical equipment and methods? Unlike the last question about using GPR to locate drain tiles or PVC pipes, ground penetrating radar, electromagnetic terrain conductivity meters (like Geonics EM31 and EM38), and magnetometers may yield desirable results when looking for a septic tank. If the septic tank is plastic then a magnetometer would not work. However, the Geonics EM-31 or an EM-38 may detect a change in apparent soil conductivities associated with the tank and its contents. If there is metal in the construction of the septic tank, then an Geonics EM38, EM61, or EM31 may pickup the metal, if it is not buried too deep. These none GPR methods may be lower cost than conducting a GPR survey. GPR at a site with good site conditions will yield the greatest resolution; however, there needs to be a change in materials or very little clay and wet soils. If the soils are not clay rich, ground penetrating radar may image the top of the tank and some of the associated pipes. Again, if they are not buried too deep. If you have clay rich soils and the septic tank was back filled with gravel, then one may be able to locate the excavation using GPR as well as possibly detecting the top of the tank. I need to locate pvc pipes of a drainfield, buried about 2 feet deep in ditches filled with gravel and covered with sand or soil. This is not a working drainfield, so there is no water. GPR is often used to locate shallow drain tiles, PVC pipes, and corrugated plastic pipe. Ground penetrating radar may not work very well to locate an actual drain pipe or tile in clay rich soils. However, if you have clay rich soils, you may be able to locate the trench (if it is wide enough) since it is filled with gravel. If you have soils that allow the electromagnetic pulse from the GPR transmitter to reach the drain tile and reflect back to the GPR receiver, then you only need to make sure the PVC pipes are not too small to detect. In sand and gravel environments, filling the PVC pipes with water may help. Of course, this all assumes you do not have other facilities that can complicate the survey. I have a test area with a corrugated drain pipe that drains the foundation of a house. The corrugated plastic pipe emerges out the side of a hill. I have used both a Sensors & Software Noggin Plus 250 MHz GPR antenna and a Sensors & Software pulse EKKO Pro 200 MHz antenna to locate it as a test. As I run parallel lines that cut across the drain pipe, I can no longer detect the drain pipe after I get to an elevation where the pipe is buried by approximately 2 to 3 feet of soil. The site has clay rich soils, so the GPR is no longer able to detect the 4 inch plastic drain pipe. Hello; I am involved in archeological research in Kentucky. Our group is researching antebellum homesites and need a method of validating locations of foundations, cellars, etc. I am interested in renting a GPR to advance our research. Please reply. Thanks. Mike G, Paris, Bourbon County, Kentucky. After you posted this comment we spoke about GPR, other geophysical methods, and the availability of assisting you with your project. You suggested we follow up in the fall just before the crops are harvested. We have an object who needs to scan soil up to 15ft. We need it for research purposes. We would need to scan area after few months for possible changes in the soil. 2ns case – we need to scan soil under railroad ways till 10ft dept. What would the best antennas for these cases? GPR rental can provide a Sensors & Software 1000 MHz Noggin system, which is used for scanning concrete. Instruction on how to use ground penetrating radar is available. While I would like to think the training would be good enough to insure positive results, only untrained persons would insure positive results. Please do not take my comment the wrong way, GPR is an excellent tool and beats out most other options; however, it is not a crystal ball. Positive results are strongly dependent on the operator, the post processing or presentation, and how the contractor uses the results. Under good site conditions, one often yields a spectacular image of features within the concrete. At times, the orientation, size, shape, depth, and other makes the presentation, interpretation, and understanding of the results far more difficult to appreciate. Do not get me wrong, if I did not think ground penetrating radar GPR was an excellent tool, this web site would not exist. The problem with GPR, as with most geophysical equipment, is that there remains a human factor, which often diminishes its excellence. Looking for a locater device to rent to use on a airport to locate electrical and other items. We are in the dallas area and in black sticky soils with some shale in the area. Sticky wet clay soils does not sound like a good application for GPR, unless you know that others have had good success finding like targets nearby. I am working with an old timer who has found very large gold specimens on his properties, up to 100ozs, and we want to look through one to two meters of desert soil on fairly steep hillsides, with brush cleared. I have a Minelab GPX5000 and various coils to follow up with, and 20yrs exp, and heavy equipment, so false signals no big deal, just need one good deep one. The 5000 only goes a meter on 20 ozs gold if you’re lucky, with a 25″ monocoil, so gpr might go the extra foot! I have 25ozs or so to test with. What antennas, brands etc. can we rent, and roughly how much per week? Ground penetrating radar is capable of finding buried metal in sand. The geophysical method often yields an image of the target. I am always surprised at the results from metal detectors. They do a good job for what they are designed to do. Since you have been getting good results with the Minelab GPX5000 you may want to continue this approach. Have you thought of renting a skid steer or mini-excavator to scrape a foot or two of sand off the top to get a little deeper? If you want to try GPR, I have had great success with Sensors & Software systems. They offer many different configurations, depending on the depth and spatial size of the target. I am looking at renting a Sensors & Software DVL III and Noggin 1000 MHz antenna for scanning concrete. How does it go together? GPR systems can vary in complexity. The Noggin 1000 MHz antenna with a DVL III has three cables to connect if everything is unplugged. Often, only one cable needs to be connected. The GPR cable end is split and connects to the DVL III and to the power supply, usually a battery pack. The other end of this cable plugs in to the 1000 MHz antenna. On the antenna there is a short cable that goes from the optical encoder measuring wheel to the antenna. Often it is not removed or unplugged. The third cable is not required and is used to connect the start button on the SmartHandle. If it is not used, then start and stop is activated on the DVL touch pad. Click here to take a look at a post that discusses more about the above GPR. Can we use GPR to locate and get size info of deep concrete pier foundation (extend down to 40 ft below ground)? I have some cellular towers where we need to get the foundation info. A ground penetrating radar survey with a low frequency antenna may very well penetrate 40 feet of concrete, if it does not have any reinforcing material. If the concrete foundation is narrow, it may not be wide enough for the signal to penetrate to 40 feet without causing multiple events, noise, or other unwanted responses, which would make it difficult to interpret the GPR response. If the foundation has metal reinforcing material in it then each occurrence of metal will reflect energy back to the surface; thus, blocking the path for energy to penetrate to 40 feet. If the GPR signal managed to find a clear path to 40 feet, it also needs to find a path back to the surface. Do you have more information about how the foundations are constructed for the cellular towers. Also, it is not clear what you want to find the size of. there are rumored to be man made caves in the rock out croppings on my property. they are backfilled enough to hide the entrances. the rooms are supposed to be very large and possibly have large quantities of gold or silver hidden inside. the terrain is rough and steep in some places. I would be over top of suspected area going through some clay, but mostly sedimentary rock is what I would like to see into. I am not familiar with GRP technology and dont want to waste my money. I have looked at the OKM Rover UC and Rover CII but I really have no idea what I need. GPR technology is incredible. It often amazes me as to what can be detected and delineated in areas with good site conditions. I would be surprised if you would be happy with the GPR response, given what you are looking for, the site conditions, and the time it takes to learn how to conduct a good ground penetrating radar survey. As for the Rover you mention, I took a quick look at what the manufacture claims it can do. I have many questions about the technology that would need to be answered before I would try one out. Putting aside any issues about the technology needed to do what they claim it can do, my greatest concern is how they create maps using GPS technology that is embedded in a cell phone. All I know is that to make maps using GPS that are accurate to within less than a foot requires differential corrections or other GPS instruments. The technology costs $10,000’s and, to the best of my knowledge, does not operate on an Android cell phone. This technology likely requires more research. I am a gold prospector trying to locate a quarts vein that should have 50 to 100 ounces of gold per 20 foot section of vein. The ground is smooth but fairly steep. The vein should be located at the surface of the bed rock which is no more than 6 to 8 feet down. On top of the bed rock is 4 feet of gravel with 2 feet of soil on top of that. Would GPR work in this situation and is there a way to rent it for use in Montana? GPR rental equipment or any other type of ground penetrating radar is not likely to yield desirable results, given your site conditions. Unless you are looking for a small fault filled feature, I think you would need to remove the soil and get down to the rock. That way you could observe what type of response you get with a 1000 MHz high frequency antenna. If the joint is detectable, GPR may help you determine the orientation of the joint and assist with locating the joint along the surface of the rock where it is not easy to observe. If you have enough gold, an EM38’s inphase response may assist with confirming the presence of gold within a small bulk volume of material (guess about 30 cubic feet of in-situ material). I need to find out if there are any graves on land I just acquired, I am planning a lot of dirt work. The ground is sandy with lite streaks of clay. Location is North Louisiana. GPR is able to locate graves with good site conditions. However, a detailed gridded GPR survey is a difficult task and often yields many false positives or no response. Individual graves are the most difficult to locate, while a lost cemetery or a mass grave site generally yields better geophysical results. Of the shallow geophysical methods available, ground penetrating radar offers some of the best detail, which, again can lead to false positives. If you are looking for groups of graves or a cemetery, Geonics terrain conductivity meters, Geometrics OhmMapper a capacitance coupled resistivity array, AGI’s SuperSting R8 84 electrode system a multi-electrode resistivity imaging technique, and a Geometrics cesium vapor magnetometer can assist with producing a robust geophysical investigation. In my experience, I have found out that no one geophysical method yields the answer. One may produce better geophysical results than another, but hindsight is always 20-20. Need help residential scanning for sinkholes! GPR works well for detecting or mapping shallow voids. The voids need to be large enough to detect and shallow enough for the GPR signal to reach. In addition to ground penetrating radar, there are several types of geophysical methods that can assist with detecting and delineating sinkholes. Depending on the location, size of the sinkhole, and site conditions it can be difficult to conduct a reasonable GPR investigation. Are you actually looking for sinkholes or are you trying to locate void spaces below the ground surface, which are a little different than a sinkhole. Voids are often formed when soils wash out from under roadways, storm sewers, or other places because of leaking water pipes or sewer tiles. These voids can be as much of a problem as a sinkhole. What is your project and how can I help you? Ground penetrating radar is often used to locate underground storage tanks. Depending on what part of the country you are from, you may have desirable results. While some people love GPR others will tell you differently. Especially engineers, geologists, or other professionals that believed there wasn’t a UST when the survey did not indicate one was there. Nothing like putting a borehole through a UST. GPR as all geophysical equipment has its limitations. In my opinion, I believe two or more geophysical instruments need to be utilized during a geophysical investigation. While GPR offers some of the greatest detail, Geometrics magnetometers, Geonics EM-31, and Geonics EM61 surveys often cost much less and are not nearly as sensitive to soil conditions. A Geonics EM31 also measures apparent soil conductivities, which may indicate a change in soil conditions at a site. For some of the highest levels of confidence, conduct surveys with a Geonics system, a magnetometer, and follow up with ground penetrating radar GPR. What would you recommend for locating tunnels at depth of 10′ to 150′? I am working in mountain area, Small amount of vegetation, but somewhat rough terian. I would be able to level off the terain to some extent, however it would be difficult to get a smooth level serface to work on. Unless you have experience with geophysical methods, it is unlikely that you will be happy. While there are geophysical instruments that can detect voids, locating voids at great depths is very difficult. For a higher level confidence, a rule of thumb is that the diameter of the void should be greater than or equal to the depth of burial. After this word of caution, if you are still interested in conducting a geophysical survey please email me back. I am willing to provide you additional information, if needed. Depending on what you rent, geophysical equipment often rents for $100’s per day and is often charged from the day it leaves until it returns. These charges may not include shipping or other mobilization type fees. Thanks for the response. I have a contact that has GPR equipment; however he only has a 250 antenna. His equipment is US Radar. What I am saying is that I have someone that can run the equipment. My reasoning behind using an antenna that can detect deeper depths is that if I cross a tunnel, I am thinking that I can follow it to the entrance, which obviously will lead to shallower depths. I have an area of suspect, but the slope of the terrain is about 30%. I am thinking I would start at one point and work my way out. Deeper depth detection should give me a starting point much quicker. What are your thought on my reasoning? In my opinion, I think the GPR, with a lower frequency antenna in real life conditions, may only penetrate 10 to 40 of feet. Other factors may reduce this estimate (e.g., course material can cause scattering and the soil-rock interface will reduce the energy available to reach greater depths). I think a bigger problem for you may be that the tunnels are not large enough in diameter for you to locate, especially in rough terrain. Your GPR expert should be able to suggest what equipment you need. There are 50, 100, and 200 MHz GPR antennas available. GPR Rental instruments are always available. But, given the amount of area you have to cover have you considered other geophysical methods? No. 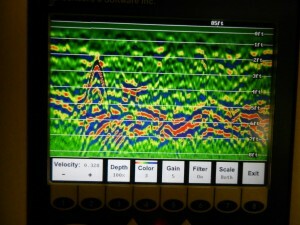 Just saw GPR and it looks like it can do anything. Geophysical equipment like a Geonics EM-61, Geonics EM-31, or a Geometrics magnetometer are able to cover large areas faster than a detailed GPR survey. In open fields and areas with only the utilities you are concerned about (no buildings or other cultural features) these instruments work well for, what I call, reconnaissance. I call it reconnaissance because, unlike common utility locating services, one does not know what may be on-site. These geophysical instruments can be used with GPS or on a formal grid system. Metal pipelines are usually easy to locate, up to depths of about 10 feet. After you get a clearer idea of what cable, pipelines, or other utilities you have on site, you may want to try to enhance your detail by using ground penetrating radar. Also, underground utility line locators work well, once you know where to start. Unless you know someone with GPR in the area who has detected the same utilities you are looking for at the same depths and in the same soils, I am fairly sure you won’t be happy with GPR. A target depth of 25 ft is unlikely. If, for some reason the soils would allow the GPR signal to penetrate deep enough, the utility would likely need to be 10’s of inches in diameter. Have you considered using line locator technology? I need to know which is the most economic piece of equipment to search up to 10 feet underground. What is the daily rental cost of said equipment? What other costs are involved? If the soils are appropriate for a GPR survey and you have the experience or take the time to learn how to yield desirable GPR results, a Noggin 250 MHz or a PulseEkko system are often rented. While the up front costs are higher for the PulseEkko system it costs less to get two different frequency antennas. The Noggin is a single frequency system and is somewhat easier to operate out of the box. The Noggin is about 100 lbs to ship and the Pulse Ekko system comes in two or more boxes weighing about 150 lbs. Ground services are often the most economic. 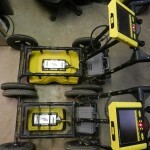 These systems can be rented from http://www.kdjonesinstruments.com, listed under ground penetrating radar GPR. You need to select a system and an antenna when figuring costs. GPR for paleontological survey dinosaur fossils 3 to 6 inches in diameter at depths between 1 and 3 feet. GPR is a great instrument but I would like to find out what type of geology or rock are you working in? Is there anything mineralogically or other characteristics that would differentiate your targets from the host material? What type of environment are you working in (e.g. easy access and clear verses rugged with brush)? Are you a paleontologist? Are you affiliated with a research program, university, higher education, or other government agency? As I understand it, I think some Universities had limited success with very shallow GPR. One used a 100 MHz antenna in clays but it only made it about 12 inches or so. A record this shallow with a 100 MHz antenna could be tough to interpret. I think another had good luck with a magnetometer looking for very large bones that had iron mineralization while another group tried a 1000 MHz ant in sandstone, which makes sense. Sandstone would be far more electrically resistive then the clays you are talking about. I believe trying to image subtleties like fossils in rock would be very site specific and lead to many false positive indications; however, geophysically locating fossils this way is likely better than standing at a spot and saying dig here. Looking for tile lines at a nearby airport. Can I use GPR? Locating buried drain tiles with ground penetrating radar often produces mixed results. GPR is capable of locating drain tile lines under good site conditions. There was a fairly large study conducted comparing geophysical methods used to locate drain tiles lines in farm fields. I would have to do some searching to locate the paper. I believe the geophysical survey results from GPR, a magnetometer, a OhmMapper capacitance coupled resistivity system with a towed array, a Geonics EM-31, and a Geonics EM-38 were compared. I think the data was collected in Iowa, Illinois, or Wisconsin. In any case, GPR yielded desirable results. Geophysical tests that I have conducted over the years both support and disagree with the paper. I believe the paper yielded desirable geophysical results more often than I have experienced. Basically, the wider the trench and the shallower the drain tile the more likely one is to locate the drain tile. There is a point at all sites that if the drain tile is buried too deep it can not be detected with GPR. The depth often depends strongly on soil conditions and moisture content. What GPR equipment system would you use? If you decide to go with GPR, I would try a Sensor & Software SmartCart setup with a Noggin 250 MHz antenna or a pulseEKKO Pro with a 100 or 200 MHz antenna. Both can be configured with GPS to assist with mapping. I would first try the GPR over known drain tiles. Next it may be worth taking the ground penetrating radar out where you suspect the drain tiles are the shallowest or in less clay rich soils and work towards areas where the tiles are expected to be deeper and in more clay rich soils. I knew a contractor once that was clearing borings and figured that since he did not see anything, like he did in the shallow areas, there wasn’t anything there. My point is that there is likely a point where the GPR will no longer detect what you are looking for because of bad site conditions, even though your target is still there. If you can gain access to the drain tile you may want to try slipping a 3/8in metal sewer snake into the tile, it may provide a clear response. I rented a pulseEKKO Pro with a 100 and 200 MHz antenna. 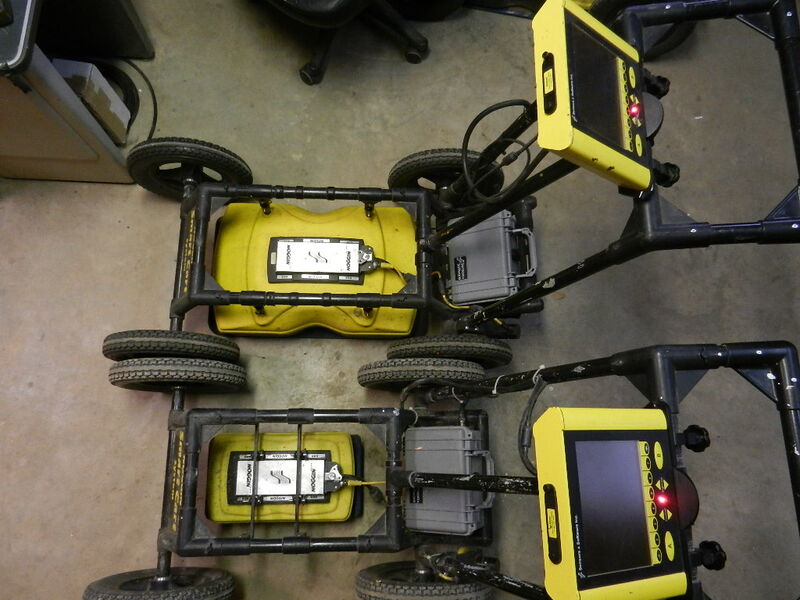 It cost very little more to rent both GPR antennas for the pulseEKKO Pro SmartCart system. I tried setting up grid systems but I found it too tedious to try and do the grid pattern and am now hitting the approximate locations of the tile, so no need for the gps anymore. It has been going so-so. It has been really hit or miss on some of the tile. I have been mostly using the 100 mhz antenna, but I am going to try out the 200 mhz this Monday. I also will try out the sewer snake approach also on the few tiles that are open and not clogged (I think having clogged tiles is part of the problem I’m not finding some of the tile, these tiles have not been cleaned since they were put in 20-40 years ago). If you have any more ideas feel free to send them my way. Thanks! If you get a chance, I would reconsider using the grid system to acquire the GPR data. GPR data collected on closely spaced perpendicular lines and plotted with Sensors & Software’s EKKOMapper program is often able to locate linear features that you can not map in the field. The GPR software combines all of the survey lines and presents the results in plan view, much like a contour plot. The graphic output represents the response from a layer thickness, based on time, for various depths of penetration. Often the minds eye can interpret GPR data presented this way better than in a single cross-section. The GPR found many underground utility lines next to the runway. Ground penetrating radar is one of the highest resolution geophysical instruments available. Large pieces of solid gold make a good target. Small individual pieces would need to be located very near the surface. The problem with trying to locate gold with GPR is that it is seldom in pure form and in large enough pieces to detect. If you have gold bars in a container that is shallow enough to detect using GPR you may also want to try other types of geophysical equipment, which is less sensitive to site conditions. It can be a real challenge collecting GPR data over rough terrain or areas covered with brush. A Geonics EM38 often responds well to buried metal within the upper few feet. Again, there must be a significant amount of metal, gold, to detect. If you think the gold was buried in a metal container constructed with iron, then you may want to try a magnetometer. A magnetometer responds well to iron that is in a form a magnet would stick to. Looking for gold that is going to be mined is another topic. Area needed; North eastern Michigan ,Alcona county. Are there any rentals in the area? Is there any one that supplies this service? While you have a great story, I think you need better site conditions for a ground penetrating radar survey to yield desirable results. Have a project next week. What should I use? Good morning – Thank You for information. I will check out link for the ground penetrating radar soils map and get back to you soon. Do you have “ball-park” pricing for rental of GPR unit? Geophysics, thank you for your prompt respond. In my study area the electrical conductivity varies from 40-100 μS/cm in one region and from 140 to 320 μS/cm in the other. Bedrock is typically found at the bottom of the peat. Do you think it would be a good reflector? Some peat have already disturbed means most of the time they are dry, in contrast, the undisturb peat less often we found it dry, i.e. we assumed dry when the water typically reach our talus. I am just happy if with GPR I could detect peat depth up to 10 meter. No, I do not have any experiments even this GPR. So any geophysical methods are welcome. Tropics peatman, it looks like you have a range of electrical conductivity values. When converted, it looks like the peat ranges from 4 to 32 mS/m. One rule of thumb is the depth of penetration in meters is approximated by 35 divided by the electrical conductivity of the material (be aware more accurate theoretical calculations may lead to another result). In addition, a shallow water table may stop the GPR signal from reaching the bedrock surface. Unless the electrical properties of the bedrock match the peat, the bedrock should be a good reflector. However, you may have other issues here because the peat is not homogeneous. Variations in electrical conductivities could cause variations in the velocity of the transmitted signal. Since the only measured quantity is time and depth is calculated a change in velocity could appear as a change in the thickness of the peat. If you decide to go with GPR a Sensors & Software pulseEKKO PRO system has interchangeable antennas and can be setup as a SmartCart. Additional antennas cost very little. This way you would be able to try more than one frequency and find out what works best for you. You may want to consider, depending on how much space you have and other site conditions, a detailed multi-electrode resistivity survey (AGI SuperSting) or numerous passes with a capacitance coupled resistivity towed array system (Geometrics OhmMapper). These electrical resistivity methods could resolve lateral changes in the peat. Mapping the changes in electrical resistivity with depth may lead to a reasonable estimate of the peat thickness. Electromagnetic methods with varying depths of penetration may also yield desirable results but could be more of a challenge without a wide range of depths of penetration. Depending on the stiffness or rigidity of the peat a seismic refraction survey or a mulit-channel analysis of surface waves MASW my work. However, it could be a real challenge to get enough seismic energy into the ground. One would also need to consider the effects of the water table. We can assist you with locating any of the above equipment. Can somebody tell me if I can use GPR to estimate depth of peat in tropical region. Some our field data show that peat thickness can go up to 20 meter. If so? what model of GPR to be used and in what frequency is recommended. Any thoughts is highly appreciated! Tropics peatman, this is possibly a great ground penetrating radar application. However, the electrical conductivity of the peat is going to make a big difference. Also, what do you have as a reflector for the GPR signal to bounce off of below the peat. How, wet is the peat? What is the thinnest thickness of peat you need to map? Do you have any experience with other geophysical methods? There are other geophysical instruments that may produce desirable results, but we need more information about the site. We met with the Sensors & Software representative Tuesday and he did a great job explaining the theory and operation of the unit. We spent a couple of hours working with the GPR and one of his other cable locators. We found that the unit worked well on level grassy type areas and reflections were definite and accurate when passes were made perpendicular. The unit was not as easy to use on uneven ground, with weedy undergrowth and inclines such as swells and roadside ditches, where we spend much of our time. It seemed to be not quite as accurate in this environment. We inquired about using GPR running parallel along cables hoping reflection would disappear indicating our cable end. We tried this twice and dug in suspected areas with no luck, Sensors & Software did say that this might be a operation this unit would not be best suited for. Over all we thought the unit worked well and he spent all the time and did all we ask him to try. We were just not sure it was right for our application. Let me talk to my brother and show him all of this and we will figure out which is the best route for us to go. I appreciate your information and I will get back to you on what we need to use. Hi…I am interested in renting your smart cart Noggin GPR. With the 250 antennae how deep will it read in dry sandy loam soil with clay probably at a deeper depth? I am looking for some old artifacts. I am doing a senior project at my local church. I will be relocating graves over nine acres. Per your response, you said that “I am doing a senior project at my local church. I will be relocating graves over nine acres. ” Engineering geophysical methods are used to map graves. While ground penetrating radar is often used, there is a variety of geophysical instruments that may assist with your project. GPR can provide some of the greatest detail under good site conditions but may not be the best choice for large areas and areas with less than ideal access. Geometrics OhmMapper (a capacitance couple resistivity meter), Geonics EM-38, Geonics EM-31, and magnetometers are capable of mapping large areas more cost effectively; however, they may not have the sensitivity needed to locate the graves you have at your site. Multi-electrode resistivity using an AGI SuperSting can provide great detail along a straight line but takes time to acquire the data. There is a trade off of speed, accessibility, ease of use, sensitivity, and resolution between these geophysical instruments. What are the site conditions over the 9 acres? Are there any know graves to use for testing different instruments? Thank you for responding back. There are graves already identified that are located all over the property. Most of the cemetery is located on a hill. There are not many trees or shrubs on the property and is mostly uneven grass. What would be the best method(s) to go about this project? I do not have any experience in this field but would like to learn so I can complete this project. Thank you so much for your time. I will send a separate email and we can discuss training. Is there anyone who rents GPR equipment in the Nashville, TN area? JP, if you are looking for geophysical equipment rental for engineering geophysics, includes GPR, I believe your best option in the states is K. D. Jones Instruments. They have offices in Texas and Wisconsin. On the top right side there is a link to K. D. Jones Instruments. LG, if you do not experience too much scattering or issues from water, ground penetrating radar may reach the desired depths of penetration. Sensors & Software’s pulseEKKO PRO 25 MHz, 50 MHz, or possibly 100 MHz antennas should preform better than higher frequency GPR antennas, such as, 250 MHz or 500 MHz antennas which are often used for underground utility locating services. Geophysical methods are often site specific. It is best, if you have a known crawlspace or cavern to test the GPR’s response. The size of the crawlspaces and small caverns will likely need to be meters in size and even larger with a lower frequency antenna. I will give you a call so we can discuss it further. LG, how deep do you want the ground penetrating radar to penetrate? What are you trying to geophysically locate, delineate, or image? The depth of penetration for GPR is generally frequency dependent. As long as you do not have an electrically conductive soil layer on top of the rock or the rock is highly fractured and saturated, GPR could reach its maximum penetration. However with additional information about the geology or project, you may find that other engineering geophysical surveys may produce better results. K. D. Jones Instruments out of Texas or Wisconsin should be able to provide you with ground penetrating radar GPR rental equipment you need. They have 50 MHz, 100 MHz, 200 MHz, 250 MHz, 500 MHz, 1000 MHz systems available (Noggin, Pulse Ekko Pro / PE Pro, and Conquest systems). I think you are out of luck here. If I was you, I would not try to use GPR to locate a target this small at these depths. You may want to try a unground utility locator. If you have additional information, email me back. Present text about GPR to GPRRental.com for posting. When do you need GPR equipment.